Latest great guest post for us by Alessandro Hatami. See his blog here and to see our previous articles with and by Alessandro see here. 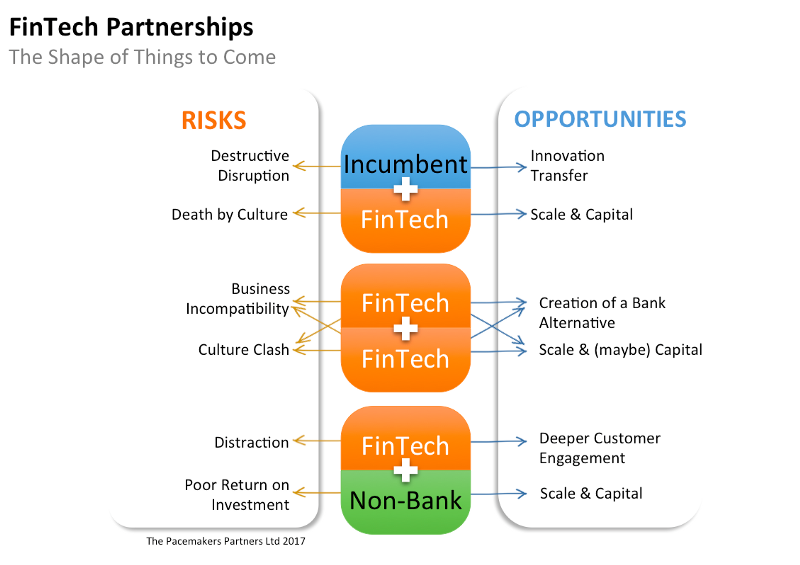 In the last few months of 2016 the mantra for big banks and FinTechs was that they are not each other’s enemies but that they should collaborate. This is probably due to the realisation by the banks that building innovation in-house is hard and by the FinTechs that it’s hard to grow with few customers, no brand and little capital. BBVA’s leadership has reiterated its commitment to digital since 2015. But as any very large diverse bank BBVA cannot simply embark on a complete redesign of its business without generating huge disruption and expense?—?especially when the ideal target operating model is not clear. A good way forward in this type of scenario is to run experiments?—?and that is exactly what BBVA has done. They have bought (or invested in) a number of “beta banks” across the globe in markets not primary to them to find the optimal operating model that could potentially be at the core of the new BBVA. Following the investment in Simple in 2014 they have invested in Atom in the UK and Holvi in Finland. The three businesses (2 challenger banks and 1 digital wallet) have common characteristics. They are all very innovative in their approach?—?with a superb CX focus, and they are based in markets where they do not compete with an established BBVA entity. For BBVA this is a well-hedged gamble: invest a few hundred million dollars to get a well-tested, blueprint of the bank of the future?—?possibly saving several hundred millions if not billions in building a new bank from scratch in house. Orange, the former France Telecom, is one of the top 10 largest mobile Telcos in the world. The Orange CEO, Stéphane Richard, called the acquisition “a major step forward in our ambition to diversify into mobile financial services […] and bring mobile banking into a new dimension”. Orange plans to use the new bank to launch a mobile-only bank in France, Spain and Belgium soon to be followed by other countries where it operates. What is interesting about this is how Orange is making the most of its greatest assets: access to millions of customers, a well-known brand and a reputation for solidity. All three assets developed in another industry to jumpstart a bank. In a world where customers are increasingly living their lives on their phones, where the reputation of the banks is in tatters and where decent banking services do not require the huge infrastructure the incumbents have led us to believe, could a Telco become a successful challenger bank? Let’s see if Orange Bank is able to create the 2 million customers in France it is aiming for. Most people involved in FinTech are familiar with Fidor. An innovative challenger mobile bank active in Germany and the UK, which uses its own social community to provide customer advice: they have 300, 000 community members providing moderated guidance to its 100,000 banking customers. In addition to being an innovative bank, they are also one of the most active promoters of platform banking enabling organisations with large customer bases to extend their relationship to financial services. Fidor are painfully aware that it can be hard for a challenger bank to acquire customers so they partner to grow faster. They do it well and their partnership with O2 in Germany is a good example. The O2 banking app is an entirely mobile banking offering that has a loyalty programme that rewards customers with data. Data is a reward that is fully aligned with O2’s core offering, is relatively inexpensive for O2 to provide and is valued by customers?—?simple and effective. It’s early days but I would think we can expect interesting?—?maybe even good?—?things from Fidor/BPCE. This is another cross-industry deal where an organisation with a large customer base and brand is seeking to extend its offering. What is interesting about this deal is that House of Fraser, a large multi brand retailer in the UK, is making a substantial bet on a challenger bank that is pre-launch with a proposition that is in development. The objective is to deepen the relationship with it’s existing customers. Frank Slevin, the retailer’s chairman who is a former senior HSBC banker, said: “House of Fraser is committed to a transformation of its business over the next five years and this new partnership is just one illustration of how we’ll deliver a meaningfully different set of services to our customers.” With this deal Tandem gets investment, access to customers, brand association and a possible link to China. House of Fraser’s majority shareholder is Sanpower a very large Chinese privately-owned conglomerate. As we know the most interesting cross-overs between banking and non-banking communities are happening in China. See WeChat’s expanding payments and financial services offering for example. Could this be another example of Chinese non-banks experimenting with financial services? One of the models considered as the possible evolution of banking in the digital age is the creation of banking hubs. Conceptually these are platforms that enable consumers to access a full suite of financial services provided seamlessly by a number of FinTechs and other third-parties. This deal is a good example of the concept. Number26 is an attractive mobile current account provider that aims to become a hub through which their customers can buy financial products provided by them or by others. In this case, N26 customers get access to a superior foreign exchange proposition provided by Transferwise. Not many of such partnerships have materialised as yet but it is a safe bet that we will see more deals of this kind in the coming months. All these deals have one thing in common?—?the desire of different types of companies to use partnerships to redefine the way they do business. 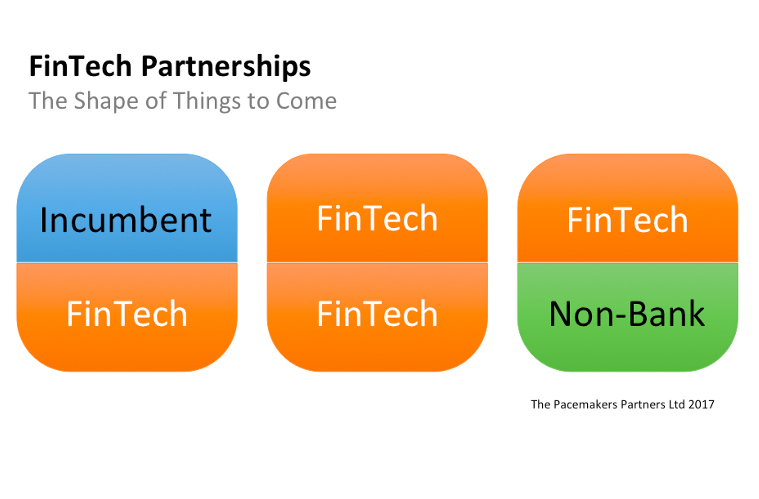 These types of partnerships would have been very difficult (or even impossible) without the new possibilities offered by the digital economy. The Incumbent?—?Large established players experimenting with innovation from the outside. (BBVA and BCPE). 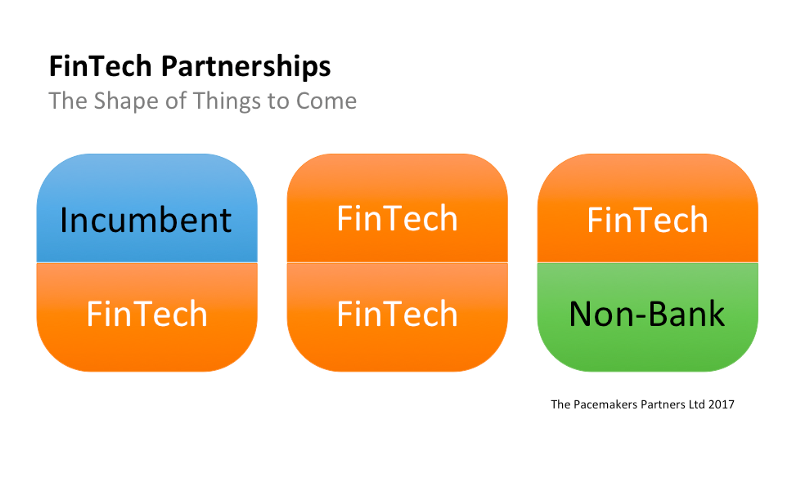 The Fintechs?—?New banks and specialised financial services providers that use technology to create a better offering. The Non-Banks?—?Large communities that aim to use financial services to increase the engagement with their members. They each engage in partnership?—?considering subcontracting, JVs, investments and acquisitions as types of partnership?—?for different reasons. The large established businesses with brands, customers and capital are seeing an upside in working with start-ups. The incumbent see it as a quick way to benefit from the new digital paradigm shift. The non-bank players are starting to see banking as another services they offer to their members. These are proactively pushing into the sector across the globe. The latest entrant in the race is Facebook with its two new eMoney licenses in Ireland and Spain. For the incumbent banks and financial services businesses, FinTechs are competition?—?the non-banks entering their market are potentially an existential threat.